Shiv Nagar, Himalayas, many hundreds of years ago. Like every little girl her age, Asha has big dreams. Unlike every little girl her age, she lives in an isolated village, banked on all sides by the highest Himalayan mountain peaks. In this remote village that no one ever leaves and that no one ever comes to, she holds on to her dreams as best she can, despite a father who’s exasperated by her daughter’s wild imagination, despite the teasing of other children in the village and, above all, despite Nirriti, an old crone who claims to speak to the gods and who’s been reminding her of all the dangers prowling outside the village’s borders since before Asha can even remember. Thankfully, Asha has her mother, Sneha, to listen to her, as well as the memories of her late beloved grandma, who encouraged her to always and only listen to her heart. 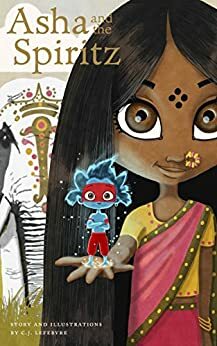 A young girl’s journey of discovery through India, to unveil the mysterious powers that regulate the mind and the heart. An illustrated novel for young and old alike, Asha and the Spiritz is a quest navigating through faith and doubt, luck and destiny, reincarnation and other infinite possibilities. A fantastic tale of hope, courage and karma. 5.0 out of 5 starsDraws you in deeply and fills you up with a calm power! A great coming of age book too! Out the box this book was beautiful as far as the cover. The book was larger than I thought at 350+ pages! The cover has a nice finish and the pages that have the illustrations have a lovely sheen with slightly raised printing that feels good in the hand. The entire book has some weight on it which I love.It was made with great attention to detail. I was surprised at the amount of chapters it has but they are quick reads and totally different thought patterns so I appreciate the separations. I enjoy the descriptions of the scenery as well I am very captivated and eager to turn the pages. I may have to buy another book to share with the girls and keep this for myself. This book is great for anyone who struggles with their emotions. It teaches the power of your thoughts and emotions. It helps to show ones personal strengths, friendship building, self awareness, learning and living your legacy... Oh I could really go on and on. This book could easily have been a series and if it were a movie I would totally go see it! The writing is so vivid though that along with the illustrations I can see everything as Asha went along the journey! We loved this book! We read it aloud together as a family with our first grader and we all loved it. A great story and characters with lessons for all ages. 5.0 out of 5 starsWoW!!! A wonderful and inspiring book!!!! This book is great and truly amazing. It is definitely worth the read. I enjoyed following Asha and her friends on her journey and you will too!